A few years ago, a couple came to the fertility doctor with a specific request: A small fraction of the woman’s genes were permanently damaged, leading to a heritable condition that had already killed her first two children. Was it possible for her and her husband to parent a healthy child who was genetically their own? Five years later, the couple now has a healthy 6-month-old baby boy with their genetic identities. The baby was the first to be born from a genetic technique called spindle nuclear transfer. Dr. John Zhang of New York City’s New Hope Fertility Center carried out the procedure. But research like this, which modifies human embryos, is banned in the United States, so Zhang performed the operation in Mexico. News of the procedure raised many questions, especially because genetic material from three parents is required for it to work. What follows are questions and answers about what happened, why, and what’s next for this innovative-but-contentious fertility procedure. Why is this technique necessary? Each cell in the body looks a little like a sunny-side up egg: a round center called the nucleus, which contains genetic information, is surrounded by a jelly-like substance called cytoplasm. Within the cytoplasm live mitochondria, which power the cell by turning food into energy. Mitochondria have their own DNA, which contains instructions to produce 13 energy-creating proteins. However, mutated mitochondrial DNA can lead to deadly diseases. In the case of this couple, the mother had Leigh syndrome, a severe neurological disorder that took the lives of her first two children. Leigh syndrome affects about 1 in 38,000 people, while mitochondrial diseases in general affect about 1 in 4,000. Mothers alone pass on mitochondrial DNA, so healthy cells passed on from the father can’t counteract these diseases. How does spindle nuclear transfer work? The doctor isolates an egg cell from a donor and removes the nucleus. Then the doctor takes an egg cell from the mother, takes out its nucleus and inserts the mother’s nucleus into the donor cell. This creates a hybrid cell containing the genetic information from the mother’s nucleus, surrounded by healthy mitochondrial DNA from the donor. Soon after, the doctor fertilizes the egg with the father’s sperm. The embryo is implanted around six days later. The technique works because the two types of DNA have separate functions and live in different locations within the cell. “The idea is that you can exploit the fact that mitochondrial DNA – which may be mutated and cause devastating disorders in humans – are physically separated from nuclear DNA,” says Dr. Massimo Zeviani, a mitochondrial researcher at the Medical Research Council in the United Kingdom. How is this different from conventional in vitro fertilization? IVF involves fertilizing a complete egg cell with sperm, incubating it, and then implanting the resulting embryo into the mother. 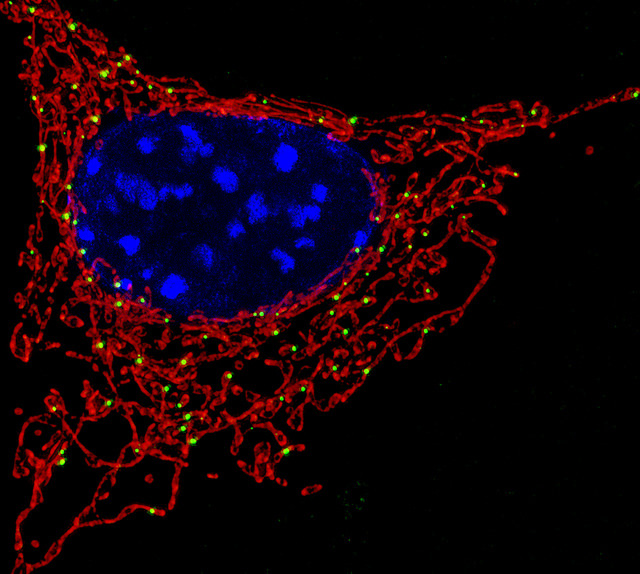 For mothers with mitochondrial disease, spindle nuclear transfer has an important advantage over IVF – the mother’s core genetic identity can be passed on to the child but the harmful mitochondrial DNA is not. The 37 genes in mitochondrial DNA have an essential but very limited purpose, since they only encode proteins related to mitochondrial function. Nuclear DNA, on the other hand, has 200,000 genes and encodes all other traits – everything from eye color and dimples to height and intelligence. So nuclear DNA is the source of the vast majority of information that forms a person’s identity. This is why the phrase “three-parent baby” – used by many media outlets — is misleading. “Mitochondrial DNA is different than nuclear DNA, and the nuclear DNA is what determines your heritage,” says Dr. James Grifo of New York University’s Langone Medical Center. Dr. Grifo pioneered the method in mice 20 years ago and referred the couple to Zhang. Yes. When the mother’s nucleus is removed from the cell, a small amount of diseased mitochondrial DNA can travel with it and be passed on to the baby, potentially sickening or even killing the infant. Chromosomes, which contain genetic information, can also be broken during the transfer, leading to harmful genetic mutations. And perhaps most importantly, until Zhang performed the procedure in Mexico, the technique had never been successfully used in humans — only in mice and monkeys. Therefore, more research on human embryos needs to be done to fully assess its risks, says Dieter Egli, a researcher at the New York Stem Cell Foundation and Columbia University. Why is the procedure banned in the U.S.? Congress passed a bill in 1996 prohibiting research that involves manipulating human embryos. This means that federal agencies cannot approve or fund research techniques like spindle nuclear transfer. The conversation revived in February 2014, when the United Kingdom considered whether or not to approve the technique, which it eventually did. The U.S. Food and Drug Administration also held a two-day meeting on the topic but decided that research efforts would not move forward. “The conclusion at the end of the [U.S.] hearing was that these methods were not ready, and that there was not sufficient evidence of safety,” says Marcy Darnovsky, director of the Center for Genetics and Society, a genetics watchdog organization. Soon after the meeting, the FDA asked the National Academies of Science, Engineering, and Medicine to assemble an expert panel on the topic. The panel recommended establishing careful guidelines and moving forward with research on spindle nuclear transfer, calling it safe and ethical. But the panel’s recommendation isn’t enough. With the Congressional ban in place, the FDA still can’t approve any research projects, preventing scientists from developing the method into a reliable, well-tested procedure for families. “The government is essentially a traffic light that cannot switch to green,” says Egli of Columbia. What’s next for this field? Despite the government’s qualms, Zhang believes that spindle nuclear transfer will eventually help scientists study a host of different topics. It will create a better platform to study stem cells, he predicts, and could eventually help older women conceive babies, too. He argues that it also provides a way to investigate the interplay between the nucleus and the cytoplasm, which could have important applications for slowing the effects of aging. “It’s going to change the way we do medicine,” Zhang says.